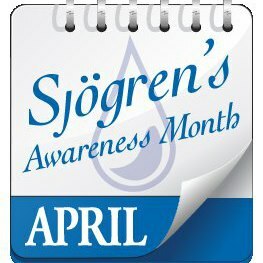 April is Sjögren’s Awareness Month and we hope you will join us in educating the public about this complex disease and how it affects those who live with its numerous daily manifestations. Sjögren's is often referred to as an invisible disease, one that, while patients may experience severe discomfort, people don’t physically see as debilitating. This can be extremely isolating for patients and also leads to the great misunderstanding about the seriousness of the disease. The SSF wants to help close the gap between the reality of living with Sjögren’s and the perception that many non-patients may have with our This is Sjögren's! April campaign. To help others visualize and understand what it is like to suffer from Sjögren’s, the Foundation will post a different phrase on social media everyday throughout the month of April that reflects what it’s like to live with the disease. Each phrase will give a small glimpse into what it’s like to live with Sjögren’s and by the end of April we hope these 30 phrases will show the complexity and seriousness of the disease. You are the voice of Foundation and we want to hear from you! Please comment below and share with us one phrase that represents what it’s like to live with Sjögren’s. Thank you for your support; together we will help others to better understand Sjögren’s! Sjögren’s (“SHOW-grins”) is a systemic autoimmune disease that affects the entire body. Along with symptoms of extensive dryness, other serious complications include profound fatigue, chronic pain, major organ involvement, neuropathies and lymphomas.